Bolero has emerged as part of the national costume of the Spaniards in the 18th century. It is noteworthy that wore it only men. In our days, the Bolero became the subject of mainly woman's wardrobe. They are knit, sewn from a soft knitted fabric, thin leather, fur and even denim. - the adaptation for installation of the blocks. For the construction of the pattern Bolero, you can use ready template or use an old denim jacket that fits you well. Strut all the seams. Flatten them and use the parts as patterns. You should get 1 item for the back, 2 shelves, sleeves, cuffs, bottom, closure and collar. Adjust the length of the product and giving details of the new denim. Sewing technology is no different from the manufacture of other products of the shoulder. Must sew shoulder and side seams. Then vacate the collar, sew the strap to the clasp and hem of the Bolero. Continue to perform the side seams of the sleeves and wtaching them into the openings. Since denim is a dense fabric, lay 2 lines when grinding parts or use a lapped seam. To work with tight denim is quite difficult. To cope with the task only for the experienced dressmaker. Novice knitters will be much easier to use for sewing the finished denim Bolero jacket. You can use both new and old. Measure the desired length of the Bolero. Its normal value just below the breast, but fashion designers in their collections have a very short denim Bolero, which represent virtually the sleeves and the collar. A denim jacket lay on the table and cut the bottom bar. Strut top lines, remove all the skin. Measure from the shoulder to the desired length Bolero. A simple swipe with a pencil line hem. Cut, leaving 1 cm for seam allowance. Apply to cut the strap and insert between its parts. Pin detail of tailor's pins, positioning them across the seam primaqiune. Prepare sewing machine. 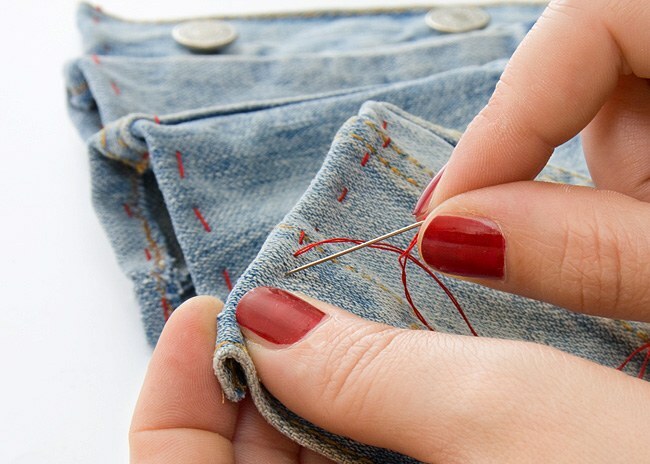 Since denim is a very thick fabric, use a needle No. 100 or No. 110 reinforced and durable thread. For primaqiune details necessary to lay a double line to do this, take a special needle or make 2 parallel lines. Take the tack and start participati bar. Try to keep the seam was located exactly along the line of the unstitched line, as the product will look neater. The lower bracket denim Bolero attach the eyelets. Mark in pencil the place of their location at an equal distance from each other. Using special fixture to install, attach the eyelets. Insert through the holes in the blocks silk scarf and tie it with a bow. This element can change depending on mood, receiving completely different images.